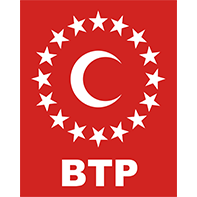 The Independent Turkey Party (BTP) was established on September 25, 2001. The party, chaired by Haydar Baş, proposes a state-centered economic plan called National Economic Model and follows a conservative-right political line. Its emblem is a white crescent surrounded by stars on red background.